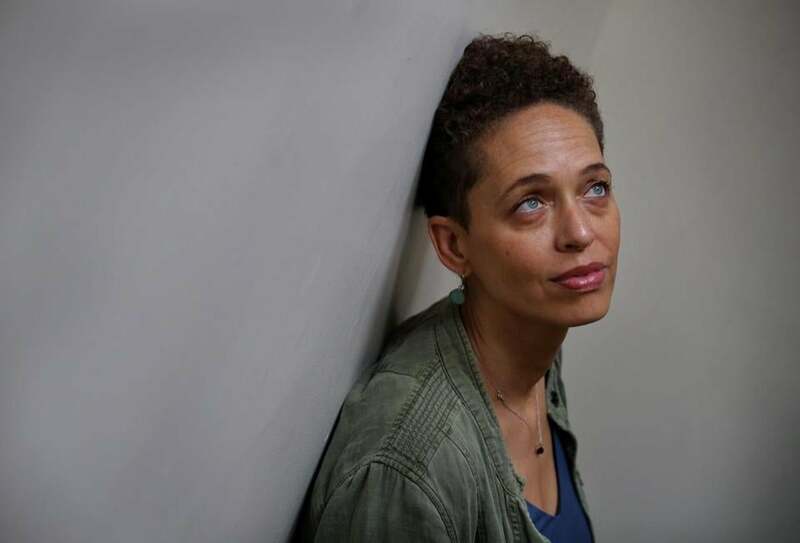 Fanshen Cox DiGiovanni, who grew up in Cambridge and is biracial, has spent much of her life grappling with her racial identity through story and performance. As a child, Fanshen Cox DiGiovanni had a cherished birthday ritual. It wasn’t cake or a favorite pancake breakfast. It was her mother’s retelling of her birth story, intended to reassure her about the details of her origins and her parents’ marriage, about which she had nagging questions. In a way, she still does. One reason she struggled with the idea of them as a couple is because her parents, who divorced when she was a child, are of different races: Her father is black, her mother is white. DiGiovanni found it hard to believe that she belonged to either of them, partly because her own light brown skin did not match theirs. DiGiovanni has spent a good part of her life grappling with her racial identity through story and performance. Now she has helped to organize a series of events in Cambridge marking the 50th anniversary of the 1967 landmark US Supreme Court case known as Loving v. Virginia that overturned state laws prohibiting interracial marriage. An actress and activist, DiGiovanni has appeared on television and in films, including small parts in “Argo” and “Gone Baby Gone,” both directed by Ben Affleck. She was classmates with Affleck and Matt Damon at Cambridge Rindge and Latin, and both are co-producers of “One Drop.” DiGiovanni is head of strategic outreach for their film company. “One Drop,” in which she plays 16 roles, examines the ever-changing racial classifications in the US Census through the lens of her own family experience. DiGiovanni is one of two children born to Winston and Trudy Cox, who were married in 1966 in California, a year before the Loving ruling but in a state where interracial marriage was legal. As a couple, they collided head-on with racial discrimination. Winston Cox, a Jamaican, was barred from bathrooms, kicked out of restaurants, and humiliated. After he and his wife settled in Washington, D.C., their interests swiftly diverged. Winston joined the Black Panthers while his wife turned to the women’s movement. Now 80, Winston believes that race was the main reason the marriage ended. “I couldn’t foresee the problems that would take place,” he said. Trudy Cox, 74, who lives in an assisted-living facility in Boston, agrees race was a part of what divided them. “He just hated it that I was white,” she said. Not only did many of the Panthers’ meetings exclude white people, but Winston himself was growing increasingly uncomfortable around them. After they divorced, Trudy Cox moved her children briefly to Maine. DiGiovanni, then 8, says students ridiculed her unusual name and recoiled when she said her father was black. But so badly did she want to fit in, that after other students called her and her darker-skinned brother the N-word, she did it too. “My brother and I got in a fight,” DiGiovanni said. “I was like, ‘I just have to come up with the word that’s going to hurt him,’ and I screamed that word at him. At the top of my lungs. Whatever the reason, his decision drove them apart for many years. It also drove DiGiovanni into a deep exploration of the why of it all; of race in America, its impact on her family, and her relationship to her parents. The result is the play she will perform twice Tuesday in Cambridge. The production is a penetrating look at many of the issues about race that tear at America today. But it is also a heartfelt embrace of a family that she loves and a father with whom she is now close again. In a way, she’s now telling her own birth story, just as her mother used to do on her birthday. This story was reported in conjunction with WGBH radio and the Schuster Institute for Investigative Journalism at Brandeis University. Sally Jacobs can be reached at sallyhjacobs@gmail.com.